Happy 4th! I think some people are thrown off by the holiday falling on a Tuesday this year. This might mess up your long weekend plans. For me, I don’t even know what day of the week it is right now! This is my last "lady of leisure" week before I start my new job! I am super excited and kind of nervous...really nervous to be honest! It's kind of scary being the new kid on the block. During this last free week, I plan to knock out a few more items on my extensive to-do list. Although I don’t plan on hosting a BBQ this year, I’m hoping to attend one or two! I have the perfect red, white, and blue look , well maybe it's orange but I digress. It was love at first sight when I found like drop waist smock dress. It gives me Flinstone fashion realness! I love things that are easy to wear; this could be worn with a pair of cute sandals or my comfy chucks. This look wouldn’t be complete without pairing it with my new fav “every blogger has one” bamboo purse. I know this purse is super trendy right now but I had to have it because I just think its classic. I didn’t go out and buy the real deal Cult Gaia but this eBay find was perfect and the quality is amazing! I also cross use this purse as décor in my house! It serves multiple purposes...it's a win! Adela is an illustrator/graphic designer from Venezuela. She is now creating beautiful work here in Atlanta. I had the best time chatting it up with this girl boss! Not only is she super talented, she has the cutest style. I knew I was going to like Adela when I first met her. Anyone who loves red lipstick as much as I do is good in my book! Check out more about Adela! What do you love about ATL? There are many things I love about this city… To start with, it has quickly become a home far from home. Its growing art scene and community are very welcoming and there are valuable opportunities for new artists that could be hard to find in other places. I’m also madly in love with the Fox Theater and the lovely houses around Midtown, Inman Park, and Virginia Highlands. Comfy and practical, but feminine as well. I like having fun with my clothes, but I’m also very classical in some aspects. In the creative field, we as artists are not expected to follow a particular rule when it comes to our look, and that’s one of the many things I love about what I do. Also sneakers > high heels. What’s your favorite piece in your wardrobe? RED LIPSTICK. Without a single doubt. I don’t need a “special occasion” to put on some red lipstick. It makes me feel great when I do, so why wouldn’t I wear it all the time? Perfume is also very important for me. My mom taught me to wear perfume even if I'm just going to bed, and I do it every single day. Why not? I have so much fun illustrating sometimes I can’t believe people pay me for it. I’m also a graphic designer, and I can’t really turn one off when I’m working on the other one, so I decided to embrace the fact that I’m both, and I love it! Getting the chance to illustrate a book and also be in charge of the design process of it is one of the most rewarding things in life. Tell me about your style of work? My style is very fun, colorful, and children-driven. I have a really good time when I work, and I think that’s something you can tell by seeing the result. I love drawing cities, kids, crazy food, and puppies. I’m also not a big fan of making a mess, so my process is almost entirely digital. I start with a pencil sketch, and right after that it’s all digital. It’s all the fun minus the mess. Who/what inspires you as a creative? I’m driven by the things I’m passionate about, whether it’s music or social and political issues. Even if those aren’t topics I work on, I believe what happens around us is always a source of inspiration. I love being around movers and shakers, because being among creative people makes a world of difference when I'm looking for inspiration. Is there a message you want to convey with your work? GIRL POWER! I’m a firm believer that girls rule this world. But besides that, I really just want to make people smile with what I do; the world is already too full of hate. Are you working on any upcoming new projects? If so, what? Always! I’m currently working on a series of illustrated children’s books that I can’t say much yet- it involves drawing a lot of city landscapes and babies; so Dream Project alert! I also like to participate in a lot of design challenges and competitions around town. I have an endless list of personal projects that I tackle whenever I have some free time. It’s all about the statement sleeves this season and I am all about making a statement! If you were wondering how you can up your blouse and top game, then a statement sleeve is the way to go. There are so many options of the exaggerated sleeve, from billowy to bell-shaped, ruffled to extra-long. It’s such a great way to add a little playfulness to your look. The top that I'm wearing could be worn so many ways! If everyday basics are your jam, then you could pair this top with a pair of skinny jeans and chucks. 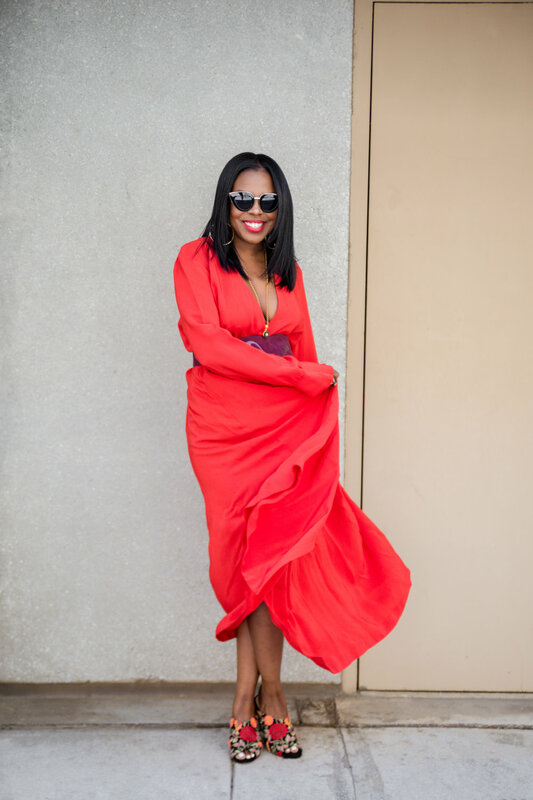 For this look, instead of less is more….I am all about more is more! I paired my bell sleeve top with a jacquard skirt from ASOS. If I could live in this look, I would! I love the mix of prints, and the skirt even has some drama with the puff hem. I love a little drama, but only in what I wear! I paired this look with my favorite Kathryn Amberleigh booties, I’ve decided that these boots are just an all year-round shoe for me. Hope you enjoyed this look as much as I did! I know they say every woman should have a little black dress but I think a red one should be added to that list! I love wearing red now! I think it's beautiful color but for some reason, I am just now starting to purchase red. I found this perfect red steal on sale at H&M for $20! The only thing that would make it even better and have me wearing this every week is if it had pockets. I freaking love dresses with pockets. Besides not having any pockets, the dress is amazing! I'm really into this floral tapestry shoe trend. These beauties are Sole Society. My in-laws gave my Mr. and I a gift card to Nordstrom's for our anniversary, so basically they gave me a gift card! I found these online and got them immediately. These are my first pair of Sole Society so now I'm hooked! I couldn't decide if wanted to wear the dress completely loose and flowy or cinch it up with a belt. As you can see, the belt won! I found this vintage, leather Charles Jourdan belt on eBay a while back and when I got this dress I knew it would pair well together. My favorite part of this look, are the jewels! I found my jewelry spirit animal on IG, Old Soul. She has an amazing shop on Etsy and I am completely obsessed with her and her pieces. She takes vintage designer buttons and turns them into magic! The designer, Ashley, is totally my friend in my head. You have to check her out: Old Soul. Today I am headed to San Fran for a few days and I will be packing my red dress to spice up the joint a little bit! And by the way, this was my first time shooting with girl boss crush, Kaye McCoy! Total black girl magic and I loved her! Check out the shopping links below! Happy Easter weekend! I can't believe we are this far into the new year! I remember when I was younger, Easter Sunday was a day when I would be debuting a new outfit, and nothing has changed! Although I know what I am wearing is the least important thing about this weekend, I still love to dress up and look extra nice. For this year's Easter look, I decided to go with one shoulder frilliness! This dress is the perfect combination of pastel and neutral colors. I love pastel colors, I have so much blush and soft pink in my closet this season. I like to add a little edge when I am wearing something very girlie. Luckily for me, like I mentioned before my mom has the best taste! I swiped these Bottega Veneta lace-up 5.5-inch oxford booties from her! Although these shoes aren't made for much walking, at least not on my feet, it made this whole look. I am pretty Easter ready now! I will be spending this weekend with some of our best friends, eating and carrying on! I hope you loves enjoyed this look. Check out the details below! I am so excited to share this next chat with creative, fashion designer - Patresea Peppers, affectionately known as Peppers! I met Peppers when she was a sophomore at SCAD. I use to see her around campus just as loud and crazy as she wanted to be. I was able to get to know Peppers very well when she started working as a student worker for us and was working that front desk like she owned the joint! I have watched her grow and become the beautiful young woman she is today and I am so proud of her! It has been my great honor to look out for her as much I can. Her presence always brings a smile to my face. Check out why I adore her so much! The thing I love the most about Atlanta is you get a mix of both worlds, for me at least. You have a major city center that is all hustle and bustle, but you can drive out 45 mins or so and you have this very slow rural life. Which I love because I grew up in that setting. Being able to take a break from the city, without having to drive 6 hours back to Mississippi makes me happy. My style fluctuates A LOT! Some days, I really like to dress it up and go all out. Then other days, I am very reserved. I don’t think I have a direct style that I lean towards. It mainly just depends on the day and my mood. Monday’s I can be very reserved, since it is the beginning of the week and I am not the biggest fan of Monday. However, when Friday comes, JUST KNOW I’M BRINGING YOU ALL I GOT! My favorite piece in my wardrobe is this burgundy Gap Jacket that I picked up from the Goodwill. It’s a men’s jacket, so it is nice and oversized just like I like it. And it was only $10, which is a steal for a jacket that was probably $100 retail price. I loved that jacket so much that I think it was meant for me to have two. I went back the Goodwill a few months later, and found the same jacket in a royal blue! We were obviously meant to be. I grew up wanting to be a designer. I don’t know why I was drawn to the craft, but I literally grew up drawing paper dolls and dressing them up. I loved the idea of making women feel beautiful. When it came time to apply for school and pick a major, fashion was at the top of my list. My parents said go for it and I never looked back! My style of work is very unique, I must say, I’m not your typical fashion designer. I don’t get pleasure out of making RTW pieces. The excitement comes in when I’m able to be one with pieces I create. I love taking materials that are conventional, and adding them to high fashion couture pieces. The world around me inspires me. People, places, things, food, lol, so serious. Most of my inspiration comes from textures in nature. Textures that people may find unsettling or disturbing, I find so beautiful. I like to find a way to incorporate that texture into my design, whether it be through fabric manipulation, prints, etc..
Tell me about your upcoming project(s)? April brings a lot of new changes for me! So I am stepping into the YouTube world. I am starting my own channel. You can find me on there under Patresea Peppers. In addition, my biggest project for the year is my upcoming fall solo exhibition, “Somewhere Between ’93 and Now.” This self-exploration will feature new designs, performance art, and an array of visual media. Stay tuned! Channeling my inner dancing queen in this jumper! I fell in love with this jumpsuit when I found it online! I love anything that has a high waist, although this is a one piece the waist comes up high and that is always flattering on me. I also get to show off the tattoo I got for my birthday last September! If you are wondering what it is, it is a play on a jasmine flower done by the very talented David Morris. Anytime you can find soft denim, you should buy it! This feels like I am wearing my jammies. The wide leg is super cute but super long so I paired it with my fav shoes by L.A.M.B. that I stole from my mom. I am very fortunate that my mother has the best taste and I get to "borrow" things from her all the time, and when I say borrow I mean keep! These shoes are a few years old and are no longer available; I did see a few pair listed on Poshmark here and here. I am obsessed with hats if I have not mentioned it already. I love a good fedora! This has become my new favorite hat because I remixed it a bit and painted the words "Work of Art" on it. When I get bored with an item that I cannot seem to part with, I always try to repurpose it in some way. Check out all the deets below. I am in love with so many of the trends for Spring 2017! A few of my favorites are "walking the line" (stripes), "flower bomb" (florals), "lounging" (robes), and "light-bright" (anything pink for me)! Do you guys like the new names I came up with for the new trends?! I love the fact that most of the spring 2017 trends are things that we have seen before but remixed. For instance, we have all seen stripes before, but for spring 2017, the stripes are bold and make a statement. The spring and summer trends are so upbeat, it matches my personal style perfectly. For this look, I put together three of the trends for spring. I combined pink, utilitarian, and statement earrings! I love my jeans; ASOS calls them mom jeans with paper bag waist. The paper bag waist definitely has a utilitarian feel and these earrings are my favorite! Unfortunately, these beauties are sold out and I have not found anything like them any place else. Wearing orange and pink together is the perfect color block. These colors are very close on the color wheel and they work perfect together, especially for the spring! Check out my orange and pink combo! Did I already tell you guys that I love camo?! I have way too many items with camo print. I love this jacket that I picked up from a thrift store a few years ago. I wore it as-is for a while before I decided to reinvent it. First, I added the gold studs but then I got bored and wanted to do more to it. I enlisted the help of one of my painting alum, Hasani to do his thing on the jacket. Do you guys remember Hasani? He was the last creative I featured on the blog, you can read more about him here. I told Hasani to do whatever he wanted to the jacket and I love how it turned out. He added some splashes of gold which was a perfect addition to the jacket. My favorite addition are all the words written in little-hidden places, like “kept” written right on the cuff. For this look I added a few of my favorite brooches, the Chanel was a consignment find that I am obsessed with. The "AND" brooch was an ASOS find which is no longer available but they still have a ton of cute ones currently on the site. The cream sweater dress is also from ASOS. I feel very Olivia Pope when I wear it. I love wearing white and I would wear it all the time if I wasn't such a messy eater. And if you haven't been to Ponce City Market, it's a must go! I love all the shopping and eating you can do there! The burrito at Minero is amazing! This is probably the last “cold” weekend here in Atlanta. Although yesterday was almost 80 degrees, this weekend will probably be the last time the temp is under 60 degrees. In honor of the last cool weekend, this look features my favorite coat! Sid calls me Frank Lucas when I wear this coat for those of you who are familiar with American Gangster (insert side eye emoji). I got this amazing furry coat from TJ Maxx and it was the best $25 purchase I have ever made. I wear it every cold day we have here. I wear it when I am dressed up but I wear it most with jeans and sneakers. I also like to pin on a cute brooch, I love vintage brooches. I am still loving everything velvet, I found the most beautiful green cami dress and since it is still February I just threw on a black turtle neck to complete the look. I love layering! That is one thing I will miss when this weather really turns. By the way, you will see me wear these booties all the time because they are perfection! I stumbled across this site, The Dreslyn, about 4 years ago and found these KATHRYN AMBERLEIGH boots. I wish I got 2 pair because they are the perfect black bootie. I love all the new art at Colony Square. I took all these amazing photos there and my favorite mural there is by Lela Brunet. Happy Valentine's Day to all my lovers! Before we talk about this Valentine’s Day look, let’s talk about this amazing mural! If you haven’t noticed yet from my blog and IG, I love the murals here in Atlanta. This mural was done by @benjanik on Instagram. I absolutely LOVE this one, it is tucked away behind the Publix’s in Ansley Park. I thought it would be the perfect place to give a little valentines-realness! Sooo for Valentine’s Day I decided to go velvet! My favorite red thing to wear is my MAC Ruby Woo lipstick so instead I went with this mauve pleated wrap skater dress. Every woman should have a good wrap dress in the closet. I went with a very romantic and girlie look to celebrate this candy and chocolate filled day holiday. I love Valentine’s Day because it’s the one day a year I eat a whole box of Whitman’s chocolate (without feeling guilty). I paired the dress with these fun boots from ASOS! I fell in love with the tapestry floral booties trend. I am not one to necessarily buy “on trend” but when I do I try to get pieces I can wear more than once. Style tip: If you buy on trend, select pieces that you can remix in a new way and wear again once the trend passes. I will definitely wear these boots again with a pair of jeans and a white t-shirt. Where do I begin when talking about Hasani?! I met Hasani back in 2012 when I first started at SCAD. At the time, I was his academic adviser. He was one of the first students that I met. In comes this young, mild-mannered, soft soften guy with dreads. He opened his mouth and I heard the accent and when he told me he was from St. Thomas, I just instantly knew I would like him! It has been such a pleasure to watch him grow into the young man he is today. He first started off as an illustration major. He reminded me the other day of how he came to change his major to painting. He came to see me one day and expressed his interest in painting and he was a little hesitant about what to do. I told him to just take the painting class and see how things go and then we will take it from there. Well, he took that class and fell in love! Hasani hasn't put down the paint brush since! What I love most about his work is the color, he is so intentional with his color. I had the best time chatting with Hasani about his work and I can't wait to see what else the future hold for him. He has an awesome project happening this week so check out a little more about Hasani! Making art comes natural for me. It’s like my second language. The more I create the more fluent I become in speaking this language. It’s very difficult for me to put my work into a stylistic category. Mainly because my work changes constantly and also because there are so many ideas that I want to explore. Maybe one day I’ll be able to look back and say “my work fits in this category” but for now I just focus on doing what feels right. WHO/ WHAT INSPIRES YOU AS A CREATIVE? I’m inspired by basically everything. Recently, I’ve been inspired by Jazz and Hip Hop. Also, the way people interpret religious texts and themes have always been pretty interesting to me. I love watching 90’s pro wrestling so that has been an influence on my work as well. I love how easy it is to get to know everyone. During my time here I have gained so many new family members. I would describe my style similarly to how I would describe myself; comfortable, confident and laid-back. I love any piece that has paint splattered. That makes me feel at home. My “Lost in the Mood” shirt is also a favorite. It is a piece of exclusive memorabilia from the collection that Nigel Xavier and I created. IS THERE A MESSAGE YOU WANT TO CONVEY IN YOUR WORK? Sometimes messages get in the way of the work so I try not to think about them too much. However, as an artist it is important for me to always create work from a real place. I believe that the audience is able to gauge sincerity. I look for that in other artists’ work so I assume that others do as well. TELL ME ABOUT YOUR UPCOMING PROJECT? I have a few projects in the works. I will be participating in a “work-week performance” with Amanda Grae Platner entitled, “Biparisan”. We will live and work in a gallery space for 5 consecutive days. We will paint with one another for 16 hours a day while being completely silent. We will take turns choosing materials for each other as we work towards creating a successful piece. I am also excited about preparing for my solo exhibition later on this year. The Power of the P! In honor of the beautiful outpour of women uniting last weekend, I decided to feature the Power of the P, and today, P stands for PANTSUIT! Every woman should have a nice pantsuit! I think some people think a woman in a suit is some ultra-feminist badass, and well why not, she probably is! I got this suit back in September and I first wore it to celebrate my 35th birthday. I found the designer Mae Otti on IG. And can I say IG is the best and worst thing ever! It is way too easy to discover amazing things to buy! Ok...back to this pantsuit. Isn’t she the prettiest thing you've ever seen?! I mean the fit is amazing and it’s PLAID! HELLO! PLAID! This talented designer is based in Lagos, Nigeria. I didn't let something silly like another continent stop me from buying this! I sent my measurements and a few weeks later my custom made suit was at my front door. I paired it with a simple black cami and threw on my fav blue pumps; it is the perfect look for work or for going on partying! I love a good DIY project. When I can't find something I envision, I try to recreate it. I love taking different items and putting them together to create a new look. This camo/fur jacket is one of my favorite DIY projects. I love anything fur and I love camo. I got this camo jacket from a thrift shop and I wore it all the time. I stumbled across another camo jacket and added it to my collection. I decided to repurpose this jacket and I thought a fur stole would look amazing on it. I did a quick search on eBay and found a faux fur stole for under $30 bucks and purchased it! I pulled out a needle and thread and brushed up on my sewing skills. There you have it, a whole new piece to add to the wardrobe. Why give up an item that you love when you can make it look like something new?! I can’t go without mentioning this amazingly cute jeweled metal purse from ASOS! This item is no longer available on ASOS but I found a few similar items being sold on eBay. This purse is like a piece of ART! I absolutely love it. It is such a statement piece I like to wear it with just jeans and t-shirt. This is pretty much my version of a casual weekend look. Check out the outfit details below! The first creative to be featured is Melissa West! Melissa is a super talented young lady that I have grown to adore! She is a freelance stylist, photographer, and decorative painter. I met Melissa a little over a year ago when she joined my team at work. When she started, I told myself, I will train her up real good but I’m not getting attached (no new friends)! Well, a whole year later, we are attached at the hip at work. We started chasing walls together here in Atlanta. As you can check out on both of our IG pages, we love colorful murals/walls. This has really become our thing, so I thought it was a great idea to not only feature Melissa and her work but to check out our new favorite mural in Atlanta by Molly Rose Freeman . So check out my conversation with Melissa, and to see more of her, follow her on IG @melissabwest. I am really excited to feature my first Style Date! A Style Date is an opportunity for me to feature some amazing creatives in Atlanta. I started this blog to not only share my personal style but to also inspire people by the awesome talent in this city. They will share their creative craft and talk a little style on the side. The variety! There is so much to do in Atlanta and the surrounding areas. Some of my favorite things to do in Atlanta are hiking at Sweetwater Creek, shopping and eating at Ponce City Market, riding bikes on the beltline, and dancing the night away on Edgewood. Each part of city is uniquely different and has something special to offer. I love that Atlanta is a large metropolitan city but surrounded by nature. Quirky, free-spirited, bohemian! I think it is really hard to narrow down exactly how to describe my style. I’m casual but like to dress up, I love wearing black but also love color. I like a little bit of everything! A good pair of jeans! My current favorite pair are a skinny high-waist light denim jean from Anthropologie. I can’t get enough of a comfortable pair of jeans! How did you get into decorative painting? I grew up crafting with my mom and working on rental houses my parents owned. Even though the painting and laying wood floor as a kid wasn’t the most fun and creative thing to do, it taught me how to use my hands to build and create things. In high school, I took photography, ceramics, and graphic design classes. I always had a love for art. My love for fashion brought me to SCAD to study Fashion Marketing and Management. After graduating from SCAD, I started my first job running a small women’s apparel and home boutique. This is where I was introduced to Annie Sloan Chalk Paint. From there I worked on finding furniture and decorative pieces to paint and sell in the shop, teaching workshops on how to use the paint, and custom painting client’s pieces. I’ve painted everything from a ceramic planter to a king size bed to kitchen cabinets. Annie Sloan Chalk Paint can truly paint anything! Tell me about your style of work. I typically like to make things look old when I’m painting. I can take a new IKEA dresser and make it look like it is 60 years old. Layering, dry brushing, distressing, crackling, these are all techniques I do quite often. I get inspired by my surroundings. I can honestly say I can be inspired by anything. Buildings, nature, people, food, anything can spark inspiration for me. Specifically for my decorative painting, I really get inspired by old things. The older the better. An old rusty bike, a French chateau, a house that has been painted over a million times. I love laying colors when I’m painting so when I see something that has years of paint layered on I get really inspired to paint. Well, it’s the first of the year and the weather is quickly changing here in Atlanta. I can’t believe I’ve lived in Atlanta for almost 8 years now! I love where I’m from (Delaware) but Atlanta has really become my home. I lightweight love it here but I'll never admit that to Sid because he'll take all the credit for me being here. One of the things I love most about Atlanta, besides all the great restaurants, is the weather. I don’t know how I lived my whole life up north with the snow! My favorite season in Atlanta is fall because it really just feels like spring. We have way more warmer days here than cold. The weird things about me is, I love the warmer weather but I like to dress for colder days (but not too cold). I like to layer up; I love hats, coats, boots, sweaters…you name it, I love it! So, now that we are in our colder season I’m trying to get good use out of all my winter gear. I started off the year with a cute and casual look while I hung out over at Jackson Street Bridge, which by the way has one of my favorite views of the city! Word on the street is, it’s going to snow in Atlanta this weekend! I really don’t think that is going to happen but it looks like I’m ready for some snow! I have on my new fav go-to bomber from Target (Who What Wear) line. I am also rocking my favorite jeans, I can’t go wrong with a little high waist and wide-legged jeans. I feel very ‘70s when I wear them and I wear them a lot! Style tip: find “the” pair of jeans and wear them every which way you can! I cannot believe 2016 has come and gone! I remember last New Year's Eve like it was yesterday. I have never been one to do a lot on this particular holiday. This year will be like years past; I plan to keep it pretty low-key, just good food, and fun with friends...oh and course champagne! But no matter what I plan to do on New Year's Eve, I always like to dress up, as if I need a reason. I could be staying home walking around the house with sequins and fur on. The look I went for this year is pretty '80s, channeling the '80s baby I am. I love tulle, so when I found this dress on ASOS, I had to have it! I think throwing on a leather jacket with anything can change the whole look of an outfit, and I thought this was the perfect combination. This leather jacket is a staple in my closet! I refuse to get rid of it even though I can't even zipper that bad boy anymore. What pieces in your closet do you refuse to get rid of? Along with dressing up for every New Year's Eve, I also like to set new goals to work towards in the upcoming year. This year, I made my new goals back in November to get a head start on things, hence, why I started my blog before the end of 2016! High-five to myself for marking one thing off the list already! Oh! How awesome is this mural by Felipe Pantone?! Edgewood would be a great neighborhood to hangout in for NYE! You guys should check out this wall at The Sound Table! Have A Very Jazzy Christmas! Well, I finally did it! A blog! I’ve asked, requested, and demanded by many to start a blog. My first reaction has always been, hmm no! I love blogs and I love sharing my style with others but I never thought to have one myself. But here am I today... blogging! This is just a peek into my world through what I wear and how I wear it. It’s me dancing around the city discovering and sharing all the things I love in fashion and all things/people creative. I have so many friends/family I could thank for encouraging me to start a blog but I can’t name them all because that could take forever. But I do have to mention just a few! I am very fortunate to be surrounded by creative people every day, young creative people…almost 10 plus years my junior type of people. I work for a creative university and I am inspired daily. I had 4 students in particular that would continuously tell me I needed to start a blog and of course I wasn’t checking for them! Last month I met with one of my former students (Valheria, my photographer) and she turned the tables on me! I’m usually the one giving out all the good advice but she started schooling me. She said some things that pulled at my heart and by the end of the convo, I was starting a blog! I wanted to have this up and running by Christmas as a present to myself. I told one of my other former students (Vania, my brand/graphic designer) that I was finally doing this and she immediately stepped in to help me with branding and putting together this beautiful site! Before I had even thought about starting a blog, my colleague, and now gal pal, Melissa helped me get my insta popping. She is full of creative ideas and she helped me fall in love with utilizing social media. We also have this fun obsession with colorful walls, you’ll see more of that later! So thank you so much Hasani, Melissa, Peppers, Valheria, and Vania! Their encouragement and help means the world to me! You should check them out! Now let’s talk about this holiday look! Christmas is my favorite time of year! It makes you feel all warm and fuzzy inside. This is how I plan to style my Christmas day look! Although I will be in the kitchen with my mom all day cooking doesn’t mean I can’t look good doing it! What are your holiday plans? What will you be wearing?